Posted by bessie on Wednesday, November 11, 2009. 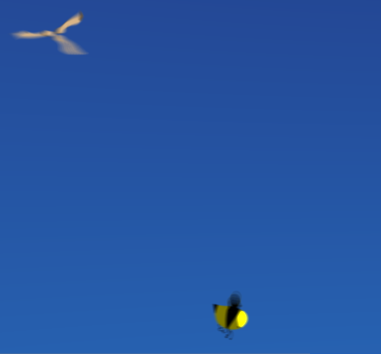 I recently received some requests from BlenderNation to write a little about how to animate a bumblebee. Toward this goal I can’t help but think about the unpredictability of planning a project under deadline and the importance of keyframing by hand. First, the planning. I could lie and talk about what an ideal planner I am. I could draw up fake storyboards and draft a fake script to make it look as though I intended every choice of this project from the start as though some twist of genius granted me direct connection to a god-like inspiration. But it doesn’t work that way, not on any project that I’ve known. Given this, one might surmise that my idea of planning is to shoot from the hip and hope for the best. But that isn’t it either. That suggests that planning is irrelevant; that good work can come from reckless behavior. Maybe it can to some people, but not to me, and never under deadline. The projects I have taken the time to plan have all succeeded to some degree or another. The projects I have failed to plan have failed themselves. But for the ones that worked, there was always a plan. Paradoxically, the plan, however good, has always changed at some point between the beginning of production and the end. For example this bumblebee project began without a single bumblebee. It was supposed to be about flowers. I happily started the script, imagining how the beautiful sun would shine its nourishing light on various plants until their seeds fell down to the soil to grow into a garden. Then I set to work on a concise voice-over narration script with lots of puns and active verbs. I sketched out a couple storyboard drawings of the plants, their seeds swelling and dropping. Everything was going according to plan. But as I opened up Blender to begin modeling something inside of me groaned. The work was boring. I had seven shots of seven plants relishing in the sunlight and growing their seeds. After modeling just one I was sick already of the plants and the sunshine and the glory of nature. My heart sank and I began to look for ways to jettison the entire project without causing too much collateral damage. This is when the bee flew in to land on the back of my pollen clogged brain, and when he did everything about the plan changed. Now there was a protagonist, the glimmer of a story, and an idea worth planning for. Now keyframing. For those unfamiliar with the animation term, each keyframe is an image that the animator creates to bring meaning to a film. Every keyframe in a finished film is necessary. Like the keystone in an arch, if a single keyframe goes missing the whole piece can collapse. In 3D computer animation keyframes are an opportunity for human touch. Keyframes take time to build for they must be made one by one by hand. The amount of labor it takes to keyframe an animation has turned away many interested people from the field. It’s just too much work. In the days of classical hand-drawn animation this labor seemed well understood. However, 3D computer animation suffers a myth that animation with the help of a enough computers can be easy. If we could only build the perfect rig, or hire enough helpers or program the perfect animation software then animation could be effortless. But if that day ever comes when all one must do is push the animate button and pull the emotion lever to somewhere between happy and sad, then animation will be finished, no longer interesting. Take the challenge away from the animators and the viewers will find no joy in watching what they make. For me it is awe that I experience when I witness animation far greater than my own. It drives me to improve and allows me to appreciate how far I’ve come. I am not a great animator by any means, but I know now that animation is worth the effort. 3D computer animation is a powerful, sophisticated, precise tool. But it is only a tool. It is not the art. It is not the artist. My older brother Michael said to me recently, “I’ve given up on the ability of computers to solve the problems of the world.” He went on to suggest that a computer is like a bulldozer. A bulldozer is very good at pushing dirt around. Bulldozers have come a long way since their ancestor, the rake. A modern bulldozer is capable of pushing so much dirt around so quickly it boggles the mind. But a bulldozer is only beautiful so long as all you need is dirt. Anything more requires a human being. This is the keyframe, that thing that only a single human being can do, that moment of communication between author and audience, the image that makes all your effort into more that a hill of dirt. So please, pour all of your energy into those keyframes, all of it. Your keyframes decide the success of the piece; the rest will follow. If you have never worked on an animation yourself then to stumble upon someone else’s work-in-progress can be baffling. The computer monitor becomes a portal into some strange three-dimensional world constantly orbiting a pale gray character wrapped in wire. The unfinished character stares vacantly forward, its arms out stiffly to the sides as though recently crucified. Even more baffling to the onlooker is how the animator, back hunched, fingers clicking rapidly at the keyboard and mouse, seems not to mind the gruesome monster and even thinks it handsome. So that’s how you animate a bee! I would imagine that solving climate change has an equally logical answer. If you discover what this answer is, please let me know. In the meantime I’ll be working at it myself, hoping another bee lands on my brain.